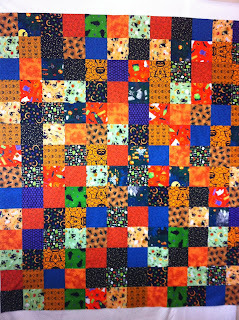 Magpie Quilts: Orange - My Least Favourite Colour! I don't have much in the way of orange fabrics in my collection of quilting cottons, but quite a few more than I had 2 or 3 years ago. And I've never been one to decorate a lot for Halloween. Maybe it's because when my kids were prime age for trick or treating, we lived in the far north and Halloween meant costumes over snowsuits. And maneuvering kids and treat bags up flights of icy stairs to get to the doors of houses that were built with above ground crawlspaces so they wouldn't melt the permafrost. But probably mostly because the colour of the spooky day is orange and it's not my first go to colour pick! And so it was with surprise that I found myself with a nice selection of Halloween themed fat quarters when I cleaned up a bit in my sewing room. I brought them with me to my weekly sewing day with a couple friends and I just cut them up into 5" charm squares - all of them, every last Halloween fat quarter. Then, I randomly put squares together in pairs, then in rows of 4 and slowly pieced together a Halloween quilt top. It's hanging in my dining room right now (just the top, not quilted) and covers up my blue and white quilt (which I LOVE!) We'll see if it lasts through to the end of the month as every time I look at it, it surprises me and gives me a little physical "jolt". Do you have a favourite and not-so-favourite colour? Tell me about them! Orange is a favourite of mine, but I don't own a single Hallowe'en themed fabric. I love your coasters especially the selvedge one. How cute! I really like orange. I even have orange clothes !! But it is hard to use in quilts without the quilt ending up looking like Halloween !